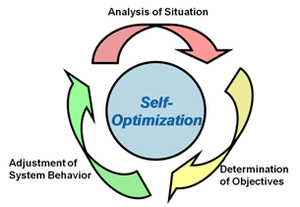 For the self-optimization it is essential that the objectives of the system are determined and adjusted depending on the current situation. A system in which only the first and third, but not the second action are carried out, cannot be truly called a self-optimized system. The first step towards self-optimization is to analyze the current situation which includes the state of the system along with the environmental conditions (noise parameters). The state of a system also depends on past observations. The next step would be to determine the objectives based on the current situation. The objectives derived in this step might not be the ideal objectives but they must be the best based on the evaluation of the current situation. This process might involve selection of an objective from a set of possibilities or adaption of an objective to the situation or generating an objective based on certain rules. The final step in the loop would be to adjust the system behavior. In this step the parameters, structure or the behavior of the system is varied based on the reference objectives from the previous step. The adjustments needed can vary from small controller adaptations to large changes in the control structure itself. Finally, the optimization is a continues process and thus making it a real self-optimized system. in the third step where, possible adjustments which are compliant to the targets. The project is specifically directed towards optimization of mechatronic systems. Major complexity involving in the developing a self-optimizing algorithm is in dealing with the interactions between various objectives and adaptations. This is so, because two different objectives may be contradictory. Also, adapting the system for one objective may have negative effects on other objectives. The interactions may vary from causal relationships to complex indirect relationships. Drive Modul The picture shows a doubly fed linear drive consisting of a car and a linear stator. The system is designed to execute several functions. Besides its main function of propulsion and braking, the system has to transfer energy from the track to the vehicle (car). The drive was designed to test the performance of the system with the new optimization strategies and algorithms. The optimization algorithms are implemented using a dSpace interface for flexibility during research. 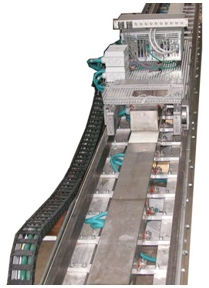 The test stand consists of a car that can be moved by two driving elements over a linear stator of approximately 8 meters in length. To simulate varying operating situations, the system is designed to have a varying air-gap depending on the position of the car. Separate power converters are used to supply current to the drive of the car and to the linear stator. The algorithm generates the objectives and the system adapts to the varying objectives to optimize amplitudes and frequencies of the currents supplied to the drive of the car and the linear stator. The generated forces are proportional to the product of the rotor- and stator current. There exists n number of solutions to generate a particular force. The objective of the optimization is to come out with the best possible solution, taking into consideration the present state. This is referred as work-point control. A work-point indicates a particular set of amplitudes and frequencies of the stator- and rotor currents. By varying the frequency and the currents the energy transfer between vehicle and track can be influenced. The primary aim work-point controls task is to meet the requirements of the energy. The efficiency of the system (converter and drive together) must be regarded as an optional optimization goal. Further, some location-dependent motor parameters, such as the air gap between rotor and stator, influence the objectives. Each objective has to be prioritized based on its importance. The result of the process is on optimal Work point suitable to a particular situation. Romaus, C.; Böcker, J.; Witting, K.; Seifried, A., Znamenshchykov, O.
 Dumitrescu, R.; Gausemeier, J., Romaus, C.
 Böcker, J; Schulz, B; Knoke, T; Fröhleke, N.